Tata Motor Group is constantly aiming to meet the customer's response via taking their requirements as a noteworthy consideration. Its Venture MPV series is truly accomplishing people's need living mostly in urban as well as rural. The manufacturer has made its appearance quite sleek with neatly done up exteriors. This model is available at the dealerships in several variants and one of them is named as Tata Venture GX . Well, there is not a big package of features, but the present ones are appreciable in making the passengers' journey pleasurable. Its outer cosmetics are pretty awesome with front fog lamps, adjustable headlights and stylish wheel covers. In spite of having average aesthetics, it looks stunning with eight distinct exterior color options to choose from. Inside the cabin, this trim is equipped with impressive features, including a digital clock, a high volume glove compartment and fabric upholstery to cover all its seats. Describing about its comfort features, these are considered as the most important section. The list includes front power windows, accessory power outlet and a few other utility based equipments. The car maker offers protection for all occupants with their essential protective functions. This variant has a central locking system, power door locks and child safety locks in order to confer a safe drive. Beneath the skin, it is powered by a 1405cc diesel engine that generates a standard power of 70bhp at 4500rpm. This mill is skilfully mated to a proficient 5-speed manual transmission gear box. To know further details about this utility vehicle, let's read below. Dimensions wise, this model measures 3950mm in length, 1565mm in width, 1878mm in height and has a wheelbase of 2100mm. Moreover, its turning radius, gross weight and fuel tank capacity are 4.5 meters, 1990 kgs and 33 litres respectively. From the visual perspective, it renders a pretty gorgeous glimpse despite having a limited number of cosmetics. The reason behind its appealing look is the eight enticing color choices, such as Ivory White, Arctic White, Meteor Silver, Glossy Black, Castle Grey, Champagne Gold, School Yellow and Blazing Red. These options are really tremendous in context of its outlook. Aesthetically, this vehicle gets a pair of front fog lamps, adjustable headlights, stylish wheel covers, tinted glass and a power antenna. Its rear windscreen is integrated with a wiper, washer and defogger. On the other hand, it has good looking bumpers, door handles and outside rear view mirrors, which are present in body color. Well, there is a lack of various features that can make it more exciting, but according to its price range the available ones are also adequate to delight the buyers as this version is doing the same for a long time now. The company believes in making an impressive cabin for its passengers. Following the same, It has given some admirable equipments, comprising an air conditioner unit with heater. Besides these, a spacious glove compartment is available to keep a few things at hand, like a digital clock, cigarette lighter, tachometer, an adjustable steering column, electronic multi tripmeter and digital odometer. This mentioned feature is truly enough in the context of making all its occupants relaxed while traveling. Total eight seats are present that have been covered with the finest fabric upholstery. The entire cabin is treated with robust plastic that is molded along with fabric inserts in the doors as well as the ceiling. All these furnishings bestow an appreciable aspect to its interior, which is based on the Barlie Beige and Linen color combination theme. This model is powered by a 1.4-litre diesel engine that has a turbocharger as well as an intercooler. It includes four cylinders and makes a maximum power of 70bhp at 4500rpm along with a peak torque of 135Nm at 2500rpm. This version has an impressive displacement capacity of 1405cc. Based on an IDI (indirect injection) based fuel supply system, the vehicle delivers 11.5 Kmpl average fuel efficiency in the urban conditions, while churning out 15.42 Kmpl on bigger roads. There is a 5-speed manual transmission box, which is skillfuly paired to this variant. A pair of sturdy disc brakes are fitted to its front wheels, whereas the rear ones get coupled to a set of standard drum brakes. The front independent suspension is a mix of McPherson strut along with an anti-roll bar. Whereas, the rear one is a multi link based mechanism in combination with coil springs. All these put together keeps this utlity vehicle well balanced and safe on any terrain. The brand has taken its passengers' convenience very seriously. There is a majestic list of comfy features, including front power windows, keyless entry, rear wiper, washer and demister. The sliding rear doors offer easy entry and exit for the rear occupants. Apart from these, this version has an HVAC with roof integrated blowers and music system along four speakers. On the other hand, it has butterfly type 3-speed front wipers, roof lamps, vanity mirror for co-passenger, retractable inner grab handles, rear utility cover and a digital information system. Mobile charging point as well as cigarette lighter are available at the front and rear end. Moreover, this vehicle gets a low fuel warning light, headrests, cup holders and other utility features. The last row has bench seats, which can be folded to increase its cargo volume. Being a top end trim, the auto maker offers almost all necessary equipment for its enthusiasts that can keep them safe during their drive. This MPV has been featured with an engine immobilizer, reverse guide system, side impact protection beams, front crash reinforcement and collapsible steering. It also unifies central locking, power door locks, passenger side rear view mirror, halogen headlights, rear set belts, door ajar and seat belt warning functions. Furthrmore, the variant comprises adjustable seats, centrally mounted fuel tank, anti-theft device, side and front impact beams. Children protection has also been considered via conferrring child safety locks. 2. Ample space for all passengers inside. 1. There is still scope to improve its exteriors. 2. ABS could have been given. 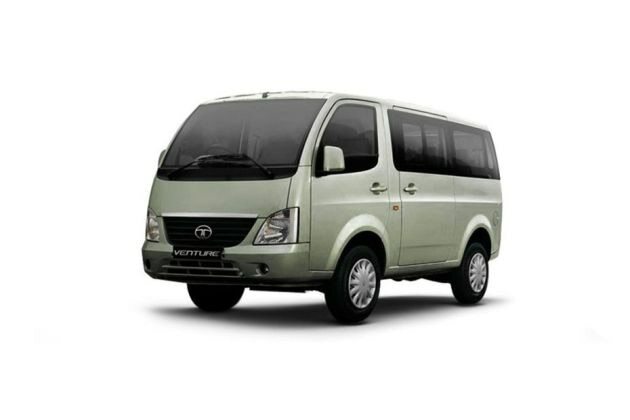 Tata Venture is available in 8 different colours - Meteor Silver, Glossy Black, School Yellow, Champagne Gold - Tata Venture, Castle Grey, Blazing Red - Tata Venture, Arctic White - Tata Venture, Ivory White.